Sometimes employees are not sure whether they are dealing with discrimination in their workplace. 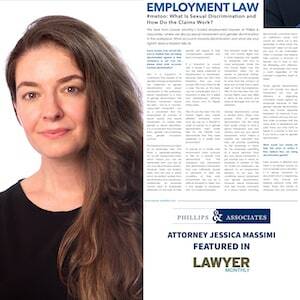 Recently, New York City employment attorney Jessica Massimi from Phillips & Associates spoke to Lawyer Monthly about what workplace sexual harassment and gender discrimination are. She also discussed what your rights are if you are a victim of sexual harassment or gender discrimination. Jessica Massimi explained that people of all genders and sexual orientations can experience gender discrimination and sexual harassment in the workplace. Sexual harassment is a type of gender discrimination. She believes that the #MeToo social media movement should not be seen as a movement for women against men, but as a movement to empower all survivors of sexual assault and harassment, regardless of gender or sexual orientation. #MeToo is a movement that includes trans, gender nonconforming, and gender nonbinary survivors. In general, New York is an at-will employment state. This means that you can be fired for any non-discriminatory reason. However, there are federal, state, and local laws that protect you from being subjected to discrimination or harassment. It is important to know your rights as an employee. For example, an employer cannot treat employees differently based on their gender with respect to benefits, compensation, or terms of employment. What if You Are a Victim of Discrimination? You should consult with an attorney if you think that you are a victim of discrimination or harassment. There are strict statutes of limitations and time-sensitive procedural requirements that you will need to follow if you want to pursue damages. This is a complicated area of law, and it is vital to find a skilled, experienced employment litigator. There are different standards that you would need to meet under federal Title VII of the Civil Rights Act of 1964 and the New York City Human Rights Law. If you bring a claim based on a hostile work environment, Title VII requires you to show that the workplace was permeated with discriminatory intimidation that was severe enough or pervasive enough to change the conditions of the work environment. You can only bring a Title VII claim against an employer with at least 15 employees. The New York City Human Rights Law applies to employers with at least four employees. You do not need to show severe or pervasive harassment under the city law. Instead, the burden is on the employer to prove that the conduct of concern was not more than a trivial inconvenience or petty slight. The federal and city laws provide for different amounts and types of damages too. There are different kinds of gender discrimination. Sexual harassment often springs to mind when people hear of gender discrimination. Quid pro quo harassment occurs when a workplace authority figure indicates that they will give something to an employee in exchange for the employee's submission to a sexual demand. Sexual harassment can also involve touching, comments, or rumors. It does not need to be quid pro quo to be the basis for a lawsuit. Gender discrimination can also be based on degrading or offensive comments made against an employee due to their gender. Gender discrimination can involve disparate treatment with regard to pay and other terms of employment. What is the First Action to Take If You Suspect Workplace Discrimination? Ms. Massimi told Lawyer Monthly that there is not any blanket advice on how to handle sexual discrimination in the workplace. However, it is critical to document events, such as by keeping personal notes with dates, times, the names of witnesses to the discrimination or harassment, and any comments or touching that occurred. It is wise to let a family member or friend know about what has happened. Victims of harassment or discrimination should not assume that their employers know. A victim should complain in writing to HR, and they should keep complaining if the harassment or discrimination continues. Often, it is frightening to face harassment. You might be scared of retaliation, and retaliation can include termination. However, federal, state, and city laws prohibit retaliation for complaining in good faith about discrimination. You should complain in writing, since this provides evidence in case of retaliation. You should also keep evidence of discrimination, such as emails or texts. The process of filing a sexual discrimination or harassment complaint in New York City is complicated and time-consuming. It is important to retain an experienced attorney. Call Phillips & Associates at (212) 248-7431 or contact us through our online form. We also handle employment litigation in the Bronx, Queens, Brooklyn, Manhattan, and Westchester, Nassau, and Suffolk Counties, as well as New Jersey and Pennsylvania.